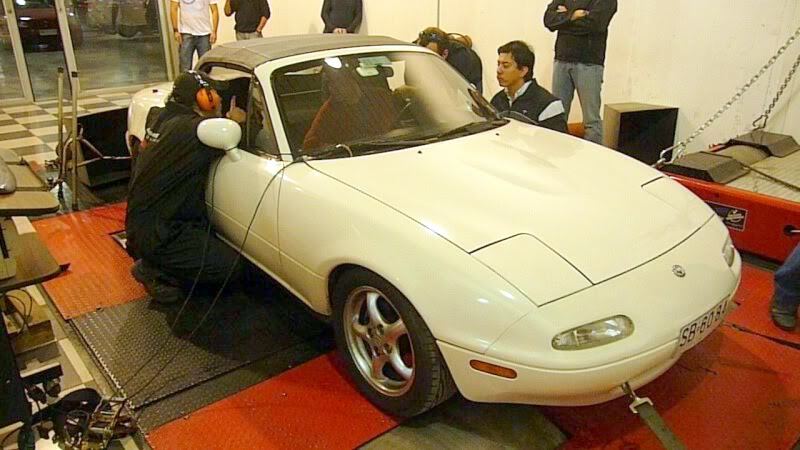 First Dyno (greetings from Chile) - Miata Turbo Forum - Boost cars, acquire cats. With a group of friends we rent a dyno for a day and finaly I know how much WHP I have (I never did go to the dyno alone, because I have to pay 100 USD for a couple of runs ). I suspect something about my level of power after doing some kills (standard sti's and evos ). Well, too much talk. Let's see the numbers at 13,5 PSI. At 7 PSI the car put 196 WHP.!! I'm very happy with the results.! Thanks to all folks that help me to set up and tune the MS.! Last edited by macanha; 06-09-2009 at 08:32 AM. here, pics of my car on the dyno. I hope, put the same numbers. (Macanha is for the same country and he help me), pretends to an identical setup. Tuesday afternoon I had the pleasure of driving the car macanha. First time I drive a turbo car. The answer is AMAZING !!!! !, I want to turbo my car NOW ... Hahahaha. (Luckily I have to wait only weeks). 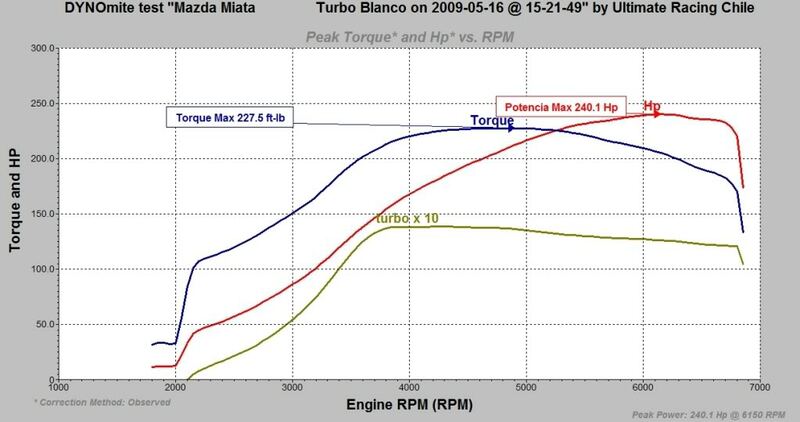 Drive to 7 psi (around 190 whp) and 12 or 14 psi (around 240 whp). At first it was a bit of shock compared to my stock miata. After coming to enjoy. Apologies for reviving a topic as old, but it was not to create another one with my experience today. You are a chicken dude. A scared chicken. Miatas are for hairdresser, but miata turbo is another story. You have to shift gears higher than 3.000 RPM in WOT to be more than a simple hairdresser. Just joking . First time I was scared too! Hope you car became turbo soon.! One strap only, and to a non structural point? Yikes!! when we were dynoing on the dyno dynamics...they didnt strap us in at all. it was wicked. I would never allow my car to be on a roller dyno with less than 4 straps, nor would I be inside a shop that had less than 4 straps on a car. If one of the rear straps came loose or broke I think they would at least help keep the car straight.